Like within any area of the law there can be fierce ramifications for false claims made before NSW’s family courts. CM Lawyers understand the collective pain both parents and children experience during events such as divorce, infidelity and break-ups. Because of this, we make sure our clients receive only the highest quality legal advice and ensure the fairest outcome in all cases we take on. It must also be noted that although the majority of family law cases reach an honest and amicable resolution, there have been examples where fighting parties lodge or make false claims. This is a very serious crime and follows serious ramifications. 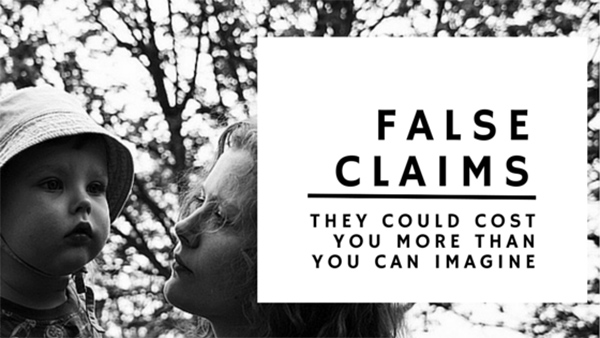 To give you an example of this type of false claim, we now look at a previous family law case that involves a husband alleging his wife made false statements following their divorce. In this situation both parents are fighting for custody of their two children with a husband seeking equal time and the wife opposing. The court eventually rules in favour of the husband by granting equal visiting hours with the children but it was in these proceedings that the husband alleges the wife made her false claim. In an attempt to corroborate conflicting information, both children in the case are interviewed and from this, the court rules that the wife made knowingly made false statements. The husband is then compensated for the additional court costs and the guilty wife is given a period of 9 months to pay. If this payment wasn’t made during such period, an interest would then accrue. We hope this article has brought clarity to the issue of false claims in family law and the type of legal ramifications it brings. Once again, CM Lawyers want to assist you in every aspect of family law and we would be extremely happy to answer any further questions you have.